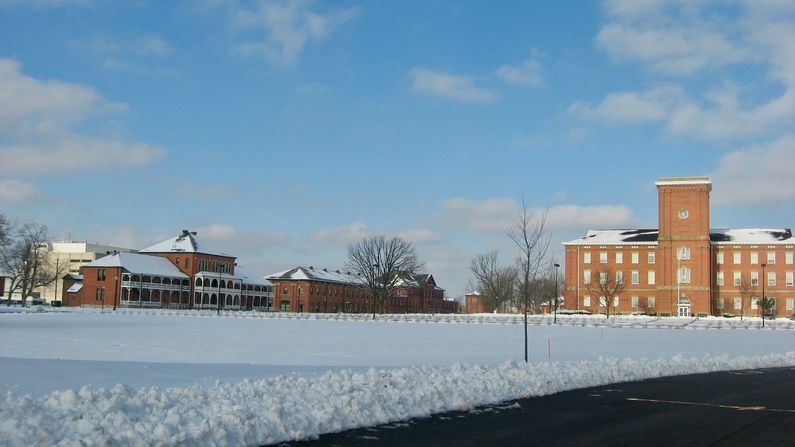 Fort Hayes (2) (1861-2009) - A U.S. Army Arsenal established as Columbus Arsenal (2) in 1861 during the U.S. Civil War in Columbus, Franklin County, Ohio. Renamed Columbus Barracks in 1875. Renamed Fort Hayes after President Rutherford B. Hayes in 1922. Deactivated in the 1960s. Last military tenant left in 2009. Established as Columbus Arsenal (2) in 1861 during the U.S. Civil War as a munitions depot. A shot tower was added in 1864. Became Columbus Barracks in 1875 and expanded into an induction center for World War I, World War II and the Korean War. Deactivated in the 1960s. Last military tenant left in 2009. Four original buildings and the shot tower remain on Fort Hayes Metropolitan Education Center (MEC), a 50 acre public magnet high school on a portion of the old post in Columbus, Franklin County, Ohio. Location: Columbus, Franklin County, Ohio. This page was last modified 09:26, 16 April 2019 by John Stanton.